36 players win $500,000 Guaranteed @AnteUpMagazine World Championship seats in tonight's $365 mega satellite. The 20-seat-guarantee in the satellite was covered early in the first level of play, with the total entry field hitting 180. 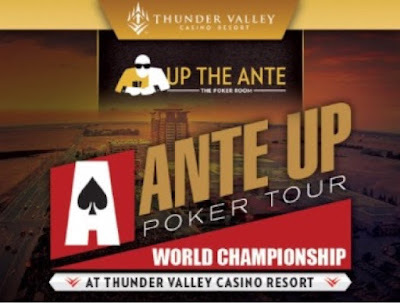 With 1-in-5 entries earning a $1,650 buy-in World Championship seat, 36 total seats are being awarded from this satellite and those players are going to be in Saturday's Day 1B World Championship field. There's one more satellite, a $365 turbo tomorrow at 10am with a 4-seat-guarantee. Day 1A of the Worlds is back from dinner break, 69 remain, playing 17 levels tonight is the plan.